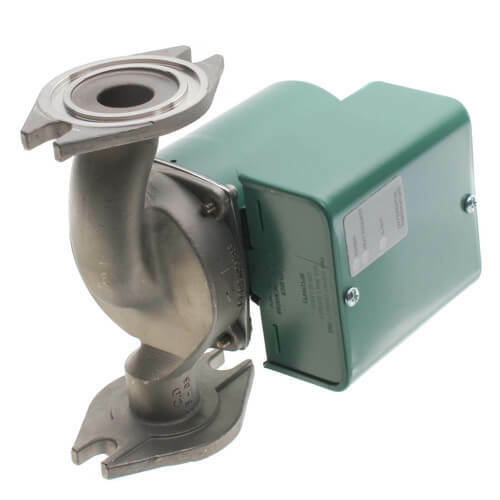 Note: Full flange-to-flange three-year warranty on all 00 Series circulators. Taco Variable Speed Delta-T Circulator's all-in-one design combines a microprocessor based variable speed differential controller with the reliability and convenience of our 00® Cartridge Circulators. Simply dial in the design Delta-T of the system or zone (from 5 - 50°F) and then sit back and watch the circulator automatically adjust its performance to match the systems ideal BTU/hr output, while conserving energy and eliminating velocity noise. No matter how good your original system design and heat loss calculations were, they included estimates and rules of thumb. What are the design conditions for those systems you "inherited" or have to service? Have a zone valve system or multi-zone radiant manifolds running off a common circulator? Your system needs a circulator that automatically adjusts to deliver the optimal heat transfer based on the actual operation of the system, every day, under all load conditions - even when those conditions change. With the Taco Variable Speed Delta-T 00® Circulators you simply dial in your desired temperature drop across the system or zone (5-50°F), attach a supply and return sensor directly to the pump and it will automatically vary its performance to deliver optimal heat, efficiency and comfort. Spend Less Time Figuring Out Pressure Drop (for proper pump sizing) when Servicing Existing Systems.